On Saturday, emboldened by the white nationalists and neo-Nazis who came out in droves to protest the removal of a statue of Confederate general Robert E. Lee in Charlottesville, Virginia, 20-year-old James Fields, an admirer of Nazi concentration camps, plowed his car straight into a crowd of counter-protesters, killing 32-year-old Heather Heyer, and injuring at least 19 others. Protests and other actions have been taking place all weekend in solidarity with those affected by the violence in Charlottesville and those who suffer bodily and emotional anguish from a country that hesitates to condemn and, more importantly, is integrally structured by white supremacist sympathies. 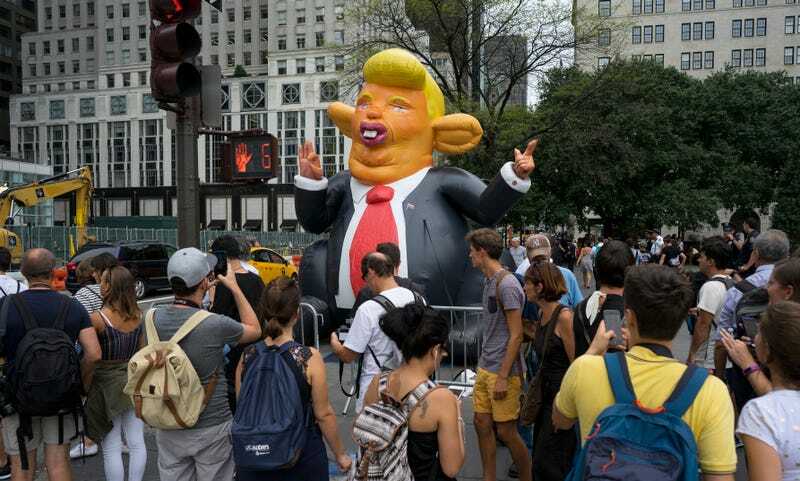 In Manhattan, in front of Trump Tower, where the President was expected to pay his respects to gilded elevators today, more than a thousand protesters are marching, according to The Guardian, with numbers likely to grow (Trump was due to helicopter in at 8:45 p.m., and wound up sneaking past the crowd, according to the Washington Post).It’s Trump’s first time returning to his old dumping grounds since taking office. In response to the violence in Charlottesville, Trump refused for days to acknowledge that white nationalism and racism in many forms had anything to do with the violence in Charlottesville, much less that it was the absolute cause of it. On Monday, the President finally denounced white supremacists, in a begrudging and entirely unconvincing display. Meanwhile, in Durham, North Carolina, protesters overthrew a monument to a Confederate soldier that’s stood upright since 1924, despite being inscribed with the words, “in memory of the boys who wore the gray,” ABC 11 reports. The statue was then bent and stomped upon, gloriously. In Nashville Tennessee on Monday, protesters made their way into Governor Bill Haslam’s office and demanded a bust of Confederate lieutenant general and early Klu Klux Klan leader Nathan Bedford Forrest be removed from the state Capitol, the Tennessean reports. [Update, 10.45 p.m.]: Jezebel is on the ground with its own Facebook-live feed of the NYC protests! These protests are ongoing and this post will be updated to reflect new developments.